Exclusive Photos from Peter Salerno Inc. Miele Showroom Gala! – Design Your Lifestyle. 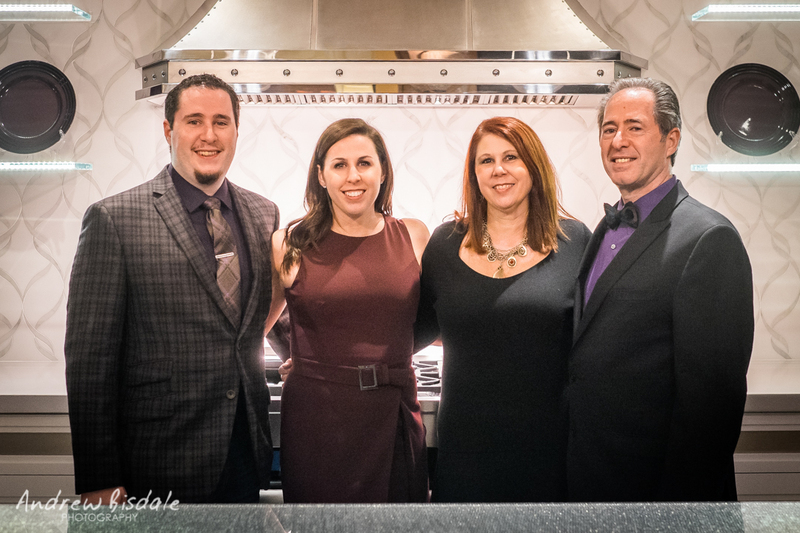 Exclusive Photos from Peter Salerno Inc. Miele Showroom Gala! November 2015 November 2015 Peter Salerno, Inc.
For several months, Peter Salerno Inc. has kept you up-to-date on its new transitional kitchen showroom vignette, filled with the incredible new line of Miele kitchen appliances. You even voted on the custom backsplash and flooring options for the showroom vignette (and Peter Salerno and his team picked the winning options). Well, the time has come to share this vignette with the world! The new Peter Salerno Inc. showroom vignette. Pictured: Peter Salerno, Bob Fava, Paul McCormack and Dan Gallagher. 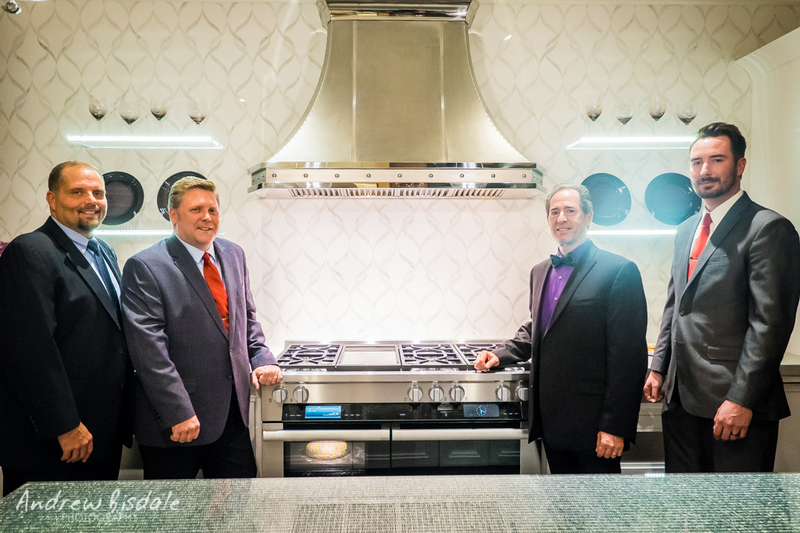 On Wednesday, November 4, 2015, Peter Salerno Inc., Miele, and some of the finest representatives of the custom kitchen design, appliance and hardware industries came together to celebrate the exclusive unveiling of this spectacular new transitional kitchen showroom vignette. Miele USA was represented by Miele USA VP of Sales Bob Fava, National Director of A&D Research Group Paul McCormack, NY Metro Regional Sales Manager Dan Gallagher, and Princeton Miele Culinary Events Manager Mary Moulds. The Salerno family celebrates the new transitional kitchen showroom vignette. Peter Salerno Inc.’s entire staff was there, including Peter Salerno, his wife and office manager Tracy Salerno, Anthony Michael Salerno and Gabrielle (Salerno) Mayer and their respective spouses. Other notable guests include Bill Volz of Oberg & Lindquist, Purcell Murray Eastern Territory Manager Craig Kmiecik, master chef Michael Latour, Nicole Sakosits of Stratta, the Tile Boutique, and representatives from such fine contractors as Hardware Design, Inc., and Edges custom cutlery. 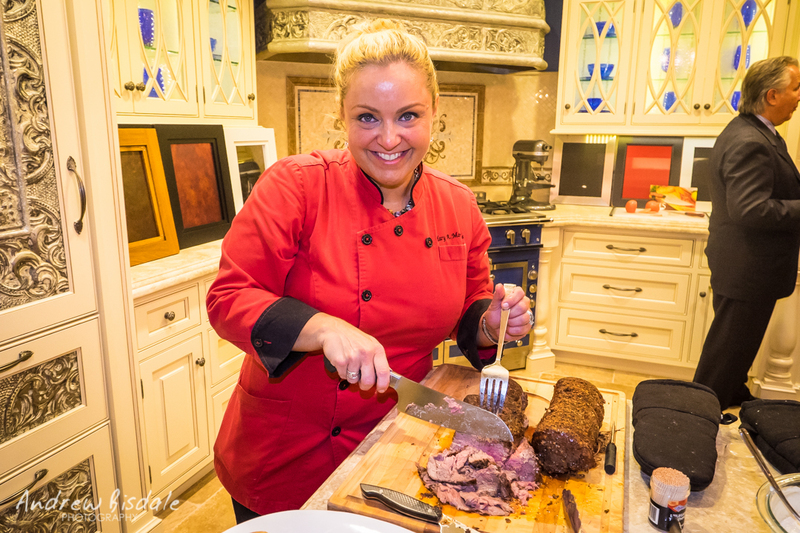 Miele Culinary Events Manager (Princeton, NJ) Mary Moulds slices a beautiful tenderloin. Special thanks to Dawn’s Catering and Service of Ridgewood, NJ, for their outstanding catering services at this transitional kitchen vignette reveal. Stay tuned to Peter Salerno Inc.’s official blog for a complete overview of the new Peter Salerno Inc. showroom transitional kitchen display, featuring state-of-the-art Miele appliances! Thank you to Andrew Bisdale for the fantastic event photography! Pingback: Peter Salerno Inc. Presents EDGES Custom Cutlery | Peter Salerno Inc.
Pingback: Peter Salerno Talks Design Inspiration At NKBA + Miele USA Presentation – Design Your Lifestyle.